I love Thai curry be it yellow, red or green. This dish uses the red paste to season the crab cakes and to make the sauce. Depending on how hungry you are or how big you make the crab cakes this recipe is ideal for both starters or a main course. I like a good amount of heat to my curry but please adjust the amount of chilli if you would like it a little milder. This recipe will make serve 4 as a starter portion. First of all chop then place your paste ingredients in a blender and blend until smooth. Pop in the fridge until needed. Time to make the crab cakes. Please take time when you are doing this. You will need to carefully pick through all the crab meat to ensure there are no bits of shell or cartilage in the mix. Place the crab meat in a large bowl then finely slice the spring onions and chilli. Add them to the bowl then add one beaten egg. Add in two tablespoons of the red curry paste then using a large spoon mix all the ingredients together. Season with a pinch of salt then squeeze in the lime and mix again. Cover and allow to sit in the fridge for at least an hour to allow the flavours to develop. Get yourself 3 large plates. Place plain flour on the first (season well with salt) two beaten eggs on the second and finally the bread crumbs on the third. 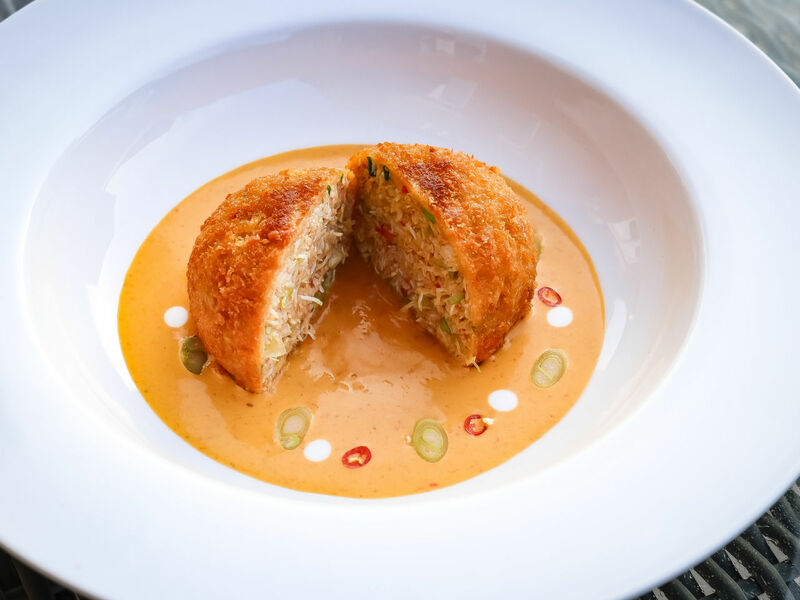 Take out the crab and in between your hands make the crab cake shape. You will need to squeeze just to get rid of excess liquid. Then carefully roll the ball first in the flour then the egg and finally the breadcrumbs. Don’t be afraid to squeeze the ball quick firmly to ensure the breadcrumbs stick. Once you have done all the crab cakes cover and pop back in the fridge for 30 minutes just to firm up. If you have a deep fat frier set it to 170 degrees if you have a pan then turn on to a medium heat and test its temperature by dropping a small piece of bread in to the oil. If it has a good sizzle the oil ought to be ready. Alternatively a meat thermometer will let you know when the oil is hot enough. Heat a frying pan with a tiny touch of oil then scoop in your remaining red curry paste. Stir gently for around a minute to cookout the rawness of the ingredients. Then add your coconut milk and stir well until there are no lumps. Finally add in the coconut cream and stir again. Keep on warm on a low heat until needed. Place the crab cakes in to the frier for 3-4 minutes or until golden brown. Once ready take out and sit on some kitchen roll for a minute. Serve by pouring some of your sauce in the bottom of a bowl then topping with the crab cake. Finally garnish with some fresh chilli, spring onions and a few drops of coconut milk. If you like squeeze a few drops of fresh lime over the crab cake.